Constructed between 1928 and 1939, the Geelong Eastern Beach Bathing complex is the last major enclosed sea bathing facility to be constructed on Port Phillip Bay, and is a focal point for Geelong's outdoor activities. Eastern Beach represents an innovative example of the work of structural engineer and architect. The baths, including timber promenade and concrete children's swimming pool is unique within Victoria. The design incorporates curved sea walls, circular promenade (baths) and concrete children's pool. The $6 million restoration project involves the reconstruction of the pool area; this includes the seawalls and dive tower replacement, the stabilisation of the embankment and irrigation system upgrade. The 110sqm children's pool redevelopment included laying the entire swimming pool in Jasba HT circular mosaics. 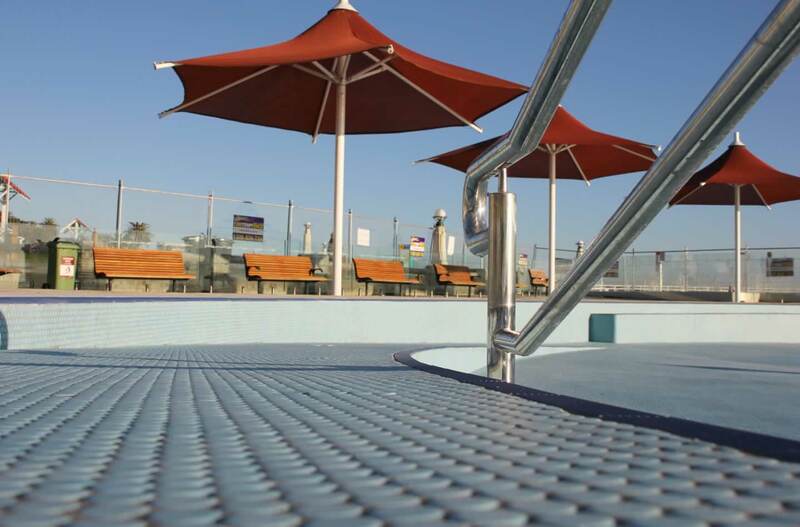 Previously the pool was painted concrete, but the City of Greater Geelong wanted to take advantage of the non-slip, anti-bacterial features to improve hygiene and reduce surface cleaning efforts. A pale blue colour scheme that closely matched the previously painted pool surface was approved by the Heritage of Victoria along with contrasting steps, seating and ramp edge safety tiles.